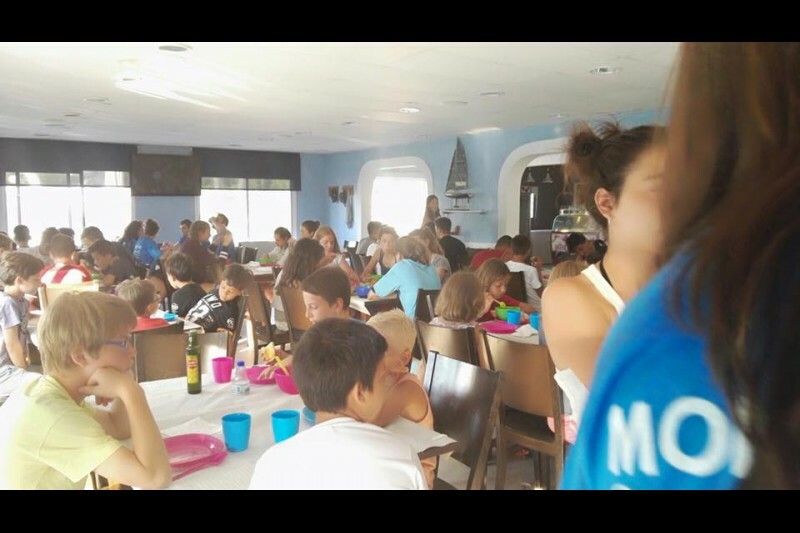 Campamentos Mediterráneo was created as a group synergy of different companies, in order to offer different educational programs during the year, in the most effective and attractive way as possible. The fact of being present in numerous educational centres working in different areas, such as our PK English project, Cambridge Exam preparation, and extracurricular activities, among others, allows us to have a team of professionals with extensive experience in this sector. Program intended for students who seek to participate in all camp activities but prefer to sleep at home. 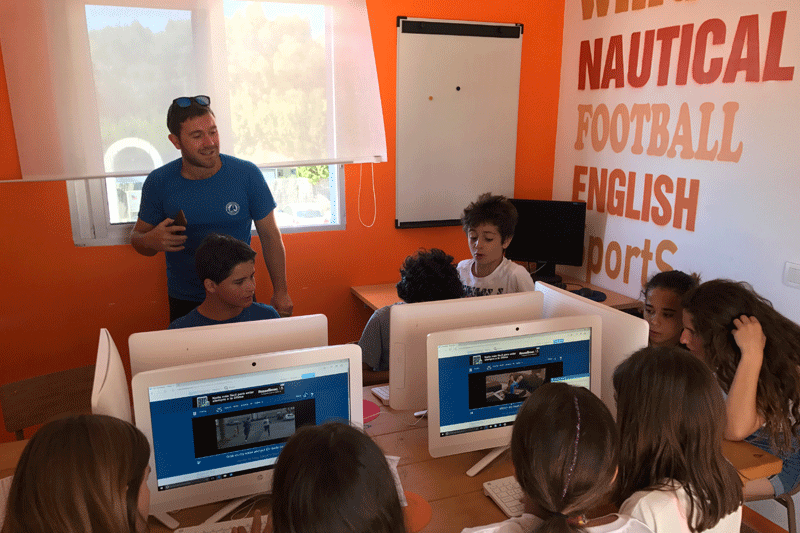 It includes language classes (to choose between Spanish and English), multi-adventure activities, water sports, sports and the possibility of choosing between robotics and cooking from the 1th to 19th July. The program includes half board (breakfast, lunch and afternoon snack). To transmit and share our passion for the sea by making possible for our students the practice of some water sports. 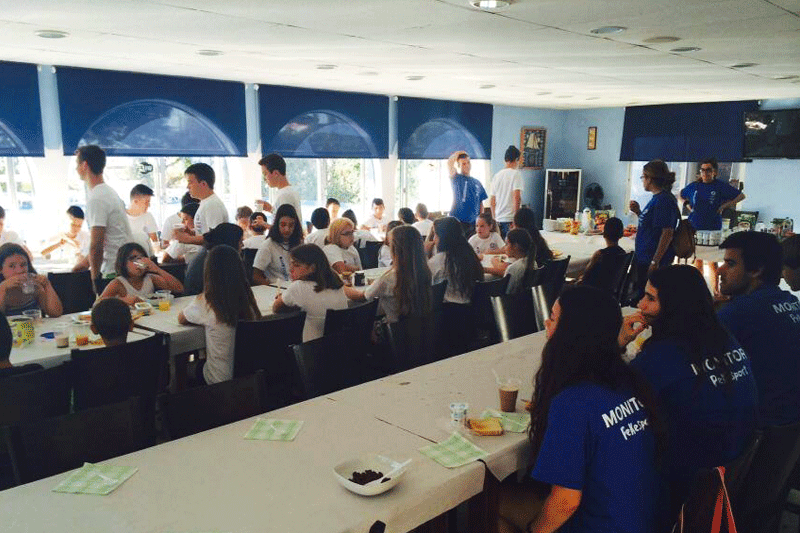 Learning English and Spanish in a multicultural atmosphere. Playing sports as a link with educational values. To empower students on their daily tasks and show them how to fend for themselves. To improve, through the proposed activities, the knowledge of the natural world and the environment. Enhancing creativity and development of attitudes, intellectual abilities and skills; in a close relationships context. Acquire Social and Environmental Commitment. To turn the free time into an educational and sporting learning and make the leisure time at school the perfect moment to develop both, physical and cognitive activities, while interrelating with each other. Learn to cook different dishes, learning of the Mediterranean gastronomy. Start with technological activities, robotics and programming. In short, learn while having fun. 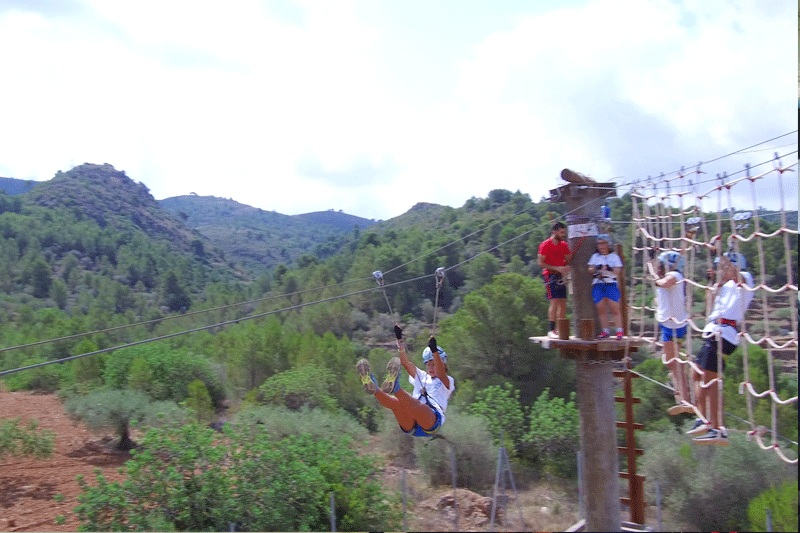 Adventure activities: Rope-bridges, climbing wall, archery, zip-line and much more! 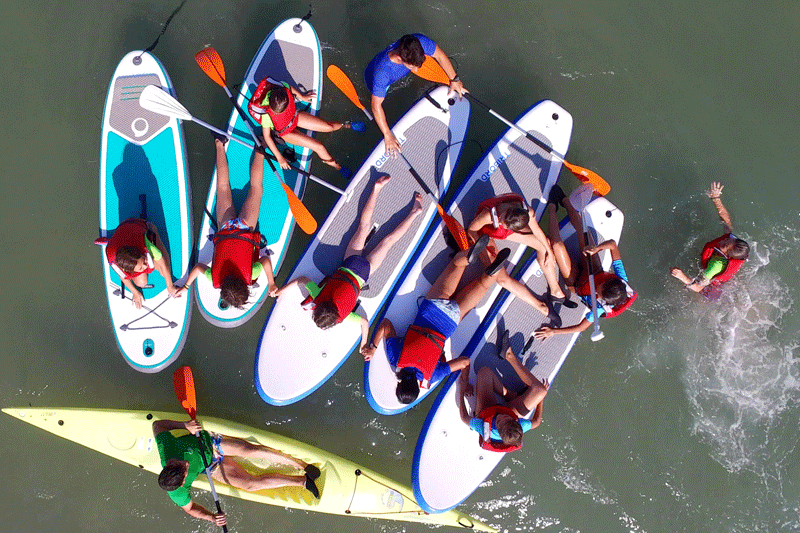 Nautical activities: Campamentos Mediterráneo has an extensive nautical program in terms of sport practice at the sea. SNORKEL and as a novelty, we introduce initiation to DIVING. In the activity of SURF, we look for soft conditions to make the first encounters with the waves more pleasant. 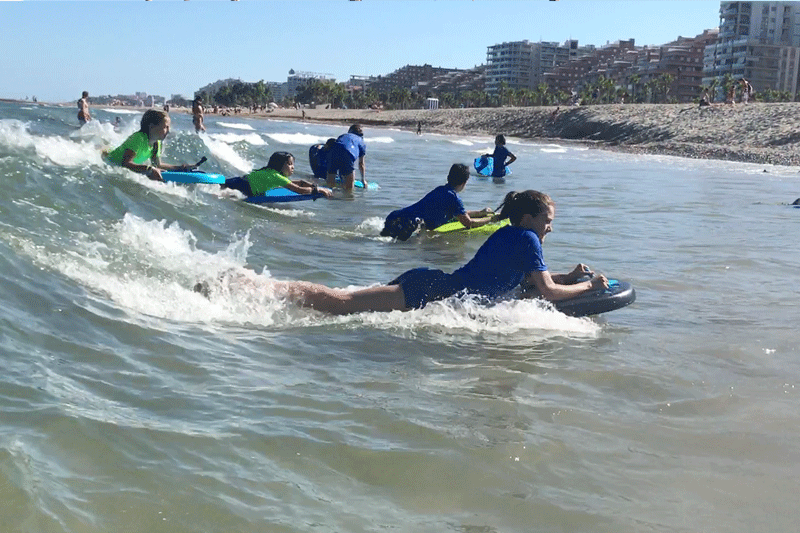 The objective is to have fun assimilating the techniques, through games, simulations with proprioceptive exercises, learn basic movements, respect priorities and harmony in the surf. The BODYBOARD serves as an initiation to surfing, since this discipline uses the energy of the waves to move us and allows us to acquire technique in order to practice with larger boards. DIVING: We perform journeys of subaquatic discovery, in which we experience the first sensations of breathing underwater. 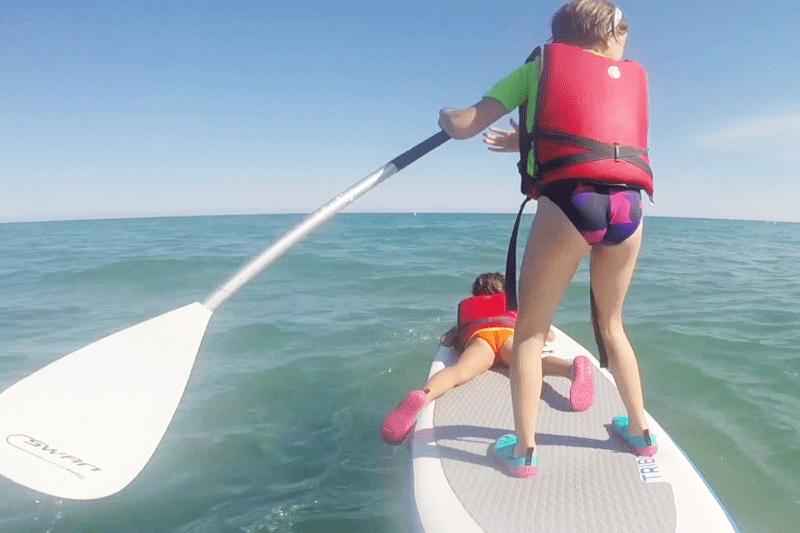 The PADDLE SURF, SUP or STAND UP PADDLE is a sport derived from surfing that is gaining great popularity, since it is learned quickly, it is not as physically demanding as surfing and it does not need waves for its practice as a crossing. It also offers a new perspective, since it allows to observe the seabed and quietly enjoy incredible views. KAYAK The different aspects of this rowing activity are as follows: Familiarising yourself with the event of capsizing: Firstly, you have to make sure that you feel comfortable in the water, that being underwater doesn't make you nervous and that you can move with ease in the water. Orientation underwater: Capsizing into the water changes your spatial awareness, as it is different from when you're out of the water. You have to learn to find reference points in this new situation in order to do the later exercises. Coordination without oars exercise. Startring position (Paulata style). Hip strokes, lateral support. 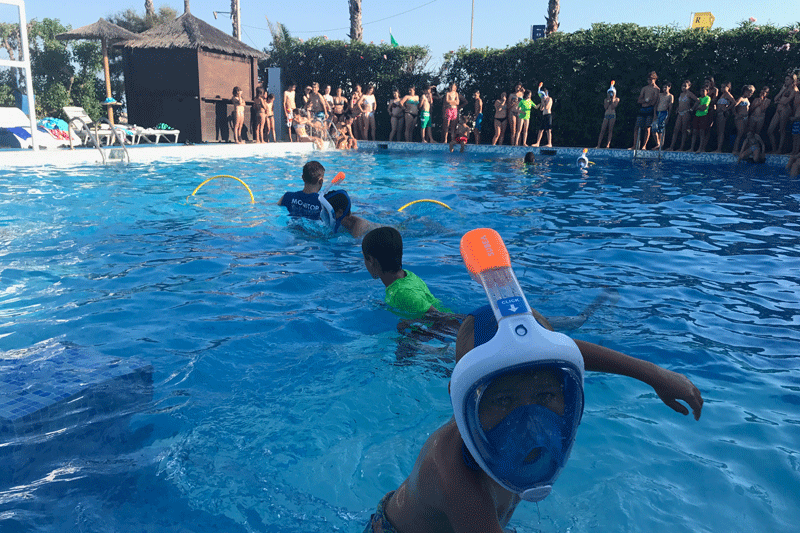 SNORKEL, we work with Easybreath masks on the beach and in the pool, to get used to breathing underwater. After that, we establish games and dynamics that favour the learning of different techniques. 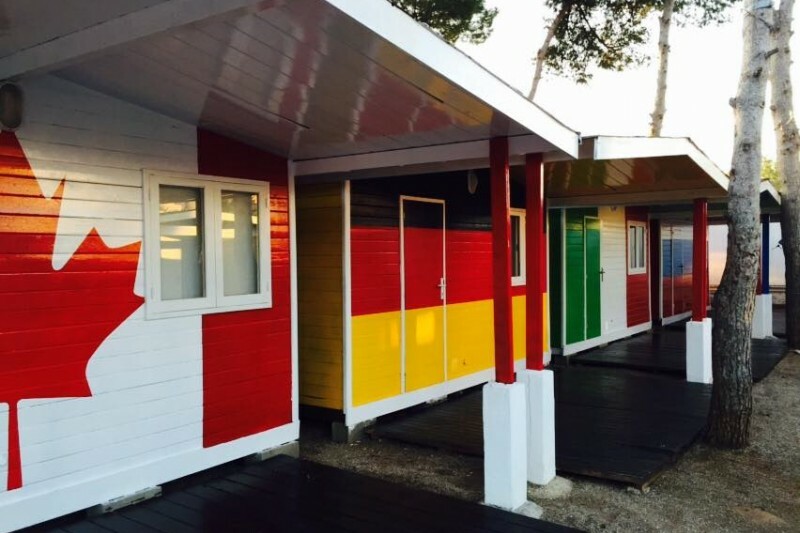 Our summer camps in Oropesa del Mar have excellent facilities on the beachfront. We have accommodations in wooden cabins with toilets and showers for the exclusive use of the participants; six classrooms for language classes and workshops (two with projector), own kitchen prepared for all types of diets (with the possibility of developing special diets such as vegans, for allergies and intolerances ...), summer pool, hot water spa , computer room, Wi-Fi, restaurant with large dining room, laundry, playground and ideal spaces around us to enjoy evening events, workshops, excursions and all kinds of activities whether sports, nautical ... and all this under full supervision 24 hours a day. 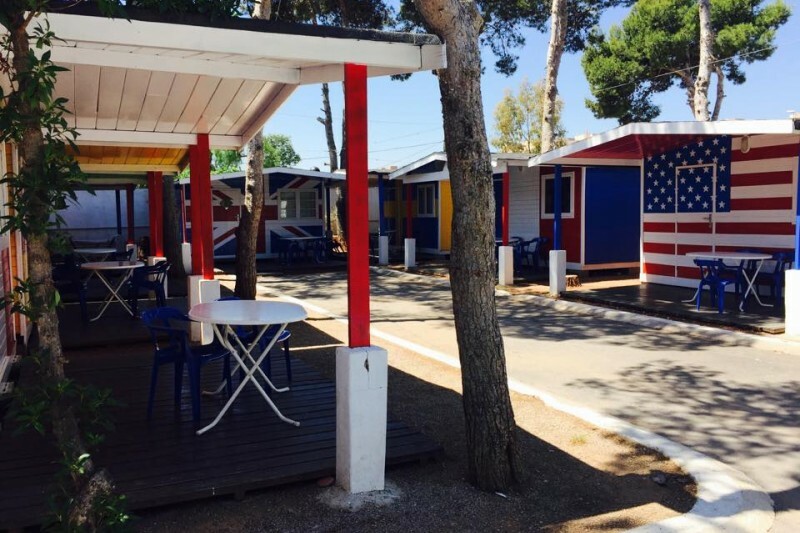 Camping Didota has facilities which are kept in continuous update, to provide an unforgettable experience to all the visitors. Half board service (breakfast, lunch and afternoon snack). For external programs students have access to the campsite with the intercity buses from Castellón to Oropesa and return to Castellón. A monitor will pick them up at the stop closest to the camping and will accompany them to the same stop at the end of the program. The AVANZABUS regular bus line is also available, departing in Madrid and stopping at Oropesa del Mar, 1 kilometre from our camp, offering pick-up by our staff. In case of being a group, the collection point can be customized according to the needs (Madrid, Barcelona, Tarragona, Valencia, etc...). The remaining cost must be paid at least 3 weeks before the start of the programme, by cheque written out to the name of the organisation, by bank transfer to our bank account or in cash. Changes in this information have been communicated to the consumer before the contract is signed and this has been expressly mentioned in the leaflet. There are modifications made later, agreed upon by both parties. This payment is made as an initial preparation and administration fee. This will be deducted from the total cost of the programme. The rest of the cost should be paid at least 3 weeks before the start of the programme. If the full payment is not made in this time, your registration will be cancelled and it will not be possible to reclaim any of the cost back. The programme prices are subject to possible variations as a consequence of currency fluctuations, increases in transport costs and in fuel costs. Any changes in prices will be communicated to the customer. When these changes are significant (an increase higher than 15% is considered significant), the customer will be within their right to cancel their booking or accept the changes.